I always seem to have difficulty in reviewing Red Sonja whenever a new creative team takes over. As a critic, it’s my job to be objective when considering a work of art. Yet the character of Red Sonja is one of the most subjective in all of comics. Red Sonja was originally created as a supporting character for Marvel Comics’ Conan the Barbarian series. The story goes that writer Roy Thomas wanted a recurring female foil for Conan, but the prominent women warriors in the original Robert E. Howard Conan pulp stories showed up at very specific places in Conan’s later life. Remembering a character from Howard’s historical short story “The Shadow of the Vulture” and having permission from Howard’s estate to adapt Howard’s other works into Conan tales, Thomas transformed the Polish/Ukrainian mercenary Red Sonya of Rogatino into Red Sonja of Hyrkania. Red Sonja’s first appearance, titled “The Song of Red Sonja,” went on to win the 1973 Shazam Award for Best Individual Story and just like that Red Sonja was a star, with a solo book of her own following shortly after. The reasons for why Red Sonja is so divisive among fantasy fans lie in these origins and the fact that, unlike Conan himself, there isn’t a definitive canon to fall back on when defining who Sonja is or isn’t apart from “redhead woman warrior who doesn’t suffer fools gladly.” Many dismiss Sonja because of her infamous chainmail bikini armor, which came about because of a misunderstanding regarding a one-off pin-up and an oncoming artist not knowing that Sonja had worn a sensible chain-shirt and leather breeches in her first appearance. The popularity of Sonja in the 1970s put that image forth and spawned the most popular image in fantasy circles of the barbarian babe in comically impractical armor. It also resulted in a lot of bad covers, drawn by artists who emphasize Sonja’s sexuality over her strength. 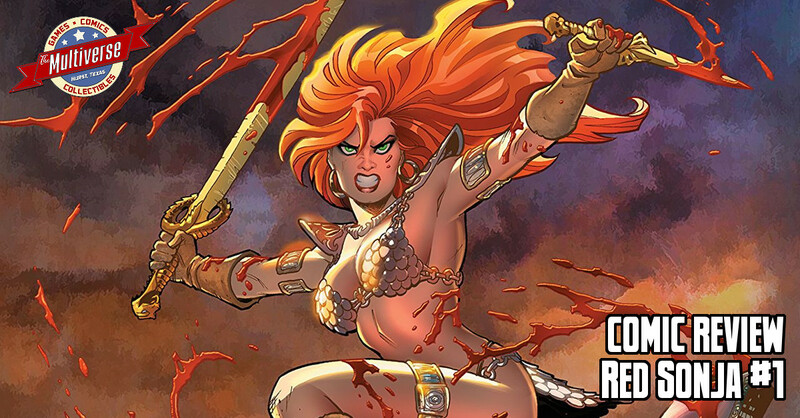 I can say that if you prefer your sword-and-sorcery serious you will probably not enjoy this new Red Sonja. If you are a Robert E. Howard purist who cannot abide any story where people other than Cimmerians evoke the name of Crom, you’ll be done after one page. Everyone else, including people who have never read a Red Sonja book before, will love it. The plot of the issue centers upon Sonja, newly returned to Hyrkania, finding herself crowned Queen in honor of her great deeds. Naturally this is being done as a precursor to the arrival of Dragan The Magnificent – a would-be emperor who intends to kill whoever is in charge of the country and take over. This leaves a world-weary Sonja preparing for war after penning an appropriately insulting response to Dragan’s demands. The fact that there is an emphasis on dark comedy should surprise no one given that this new Red Sonja is being written by Mark Russell, the Eisner-nominated writer behind The Flintstones. Yet as funny as this book is, there is still plenty of action, including one fantastic sequence which showcases Sonja’s cunning in battle as the dehydrated and dying hero must face several horse-mounted bandits simultaneously. Mirko Colak’s artwork proves the perfect partner to Russell’s script. Colak once worked on Dark Horse Comics’ Conan series and that experience shines through here. The fact that Colak plays it straight and draws this like any other sword-and-sorcery story only enhances the comedy when Russell cracks wise. The final result reads something like Gail Simone as illustrated by John Buscema. Red Sonja #1 releases on February 6, 2019!